In this lesson, we will learn how to simplify algebraic expressions using the commutative and associative properties for addition and multiplication. Fill in the blank: ( 2 8 0 + ) + 3 8 8 = 2 8 0 + ( 2 4 4 + 3 8 8 ) . Find the missing number: ( 8 , 3 0 4 + 5 , 6 0 5 ) + 4 , 7 2 5 = 8 , 3 0 4 + ( 5 , 6 0 5 + ) . Does the associative property apply to division? Simplify 3 4 𝑥 + 5 7 − 1 8 𝑥 + 1 7 . If 𝑦 5 + 4 5 = 4 5 + 3 5 , what is the value of 𝑦 ? Simplify 6 ( − 3 𝑥 ) . Which of the following is true concerning the expression 8 𝑥 + 3 + 𝑥 ? A 8 𝑥 and 𝑥 are like terms. B The simplified form of the expression is 9 𝑥 + 4 . C 8 𝑥 and 3 are like terms. D The simplified form of the expression is 1 2 𝑥 .
E The simplified form of the expression is 8 𝑥 + 3 . Which expression will have a different value to the others? Translate the following verbal expression into an algebraic one, and then simplify it: Four sets of the sum of a number and eleven are added to three times the same number. Does this work when we divide? Samar is skip counting to solve 5 × 4 . How else could she skip count to find 5 × 4 ? Which other equation would this solve? The associative property tells us we can multiply three numbers in any order, and the commutative property tells us we can swap factors. Write the missing expression: 3 × 7 × 3 = 7 × ( × ) . Find the answer: 3 × 7 × 3 = . 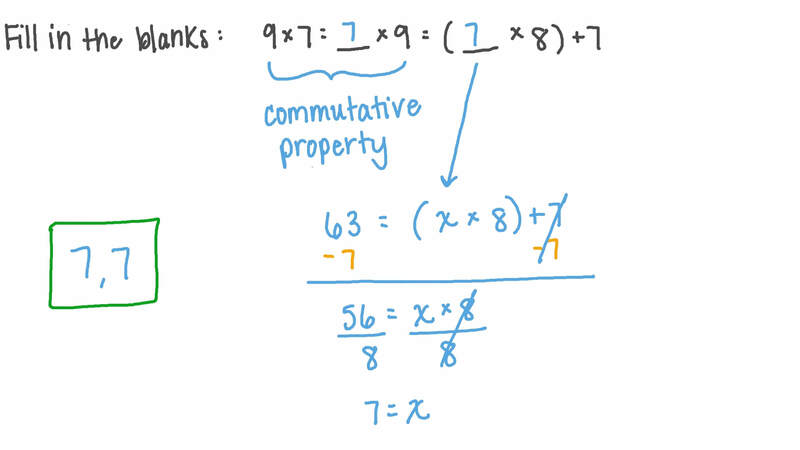 Use the properties of real numbers to simplify the expression 5 2 + ( 𝑦 + 9 5 ) to one without brackets. A rectangle’s dimensions are ( 8 𝑥 + 4 ) length units and ( 1 6 𝑥 + 6 ) length units. Express the perimeter in terms of 𝑥 and calculate the perimeter when 𝑥 = 1 . 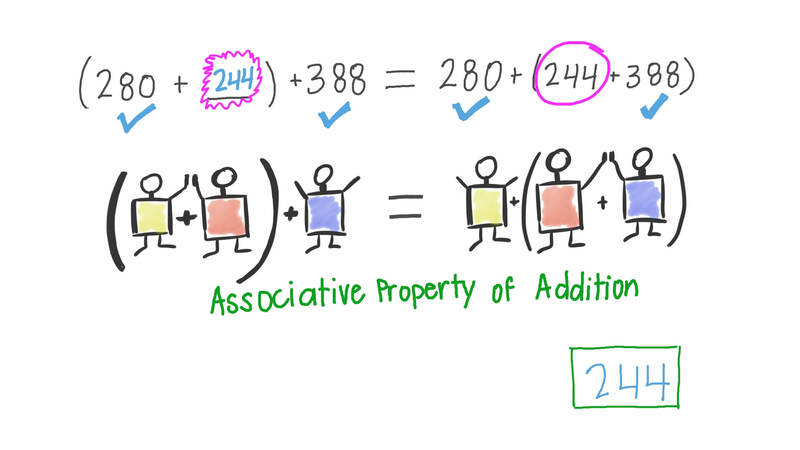 Which of the following illustrates the associative property of addition? Rewrite the expression ( 𝑥 + 7 ) + 2 using the associative property. In a class, Yara calculates and Amir calculates . Which property of addition tells us that their answers will be the same? If ( 4 5 × 𝑥 ) × 5 0 = 4 5 × ( 3 5 × 5 0 ) , what is the value of 𝑥 ? If ( 𝑥 + 5 5 ) + 3 2 = 2 4 + ( 5 5 + 3 2 ) , what is the value of 𝑥 ?